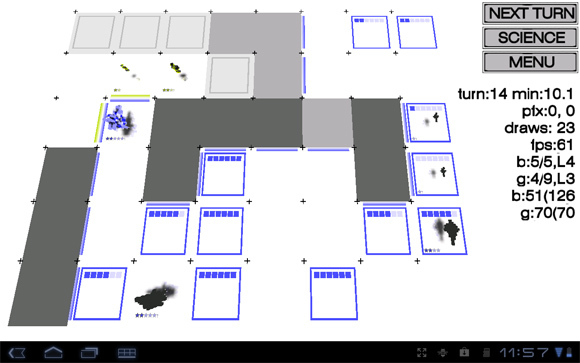 Working on my next android game: turnbased strategy, abstractly space themed, very short playtimes. Thus QSS - quick space strategy . Tell me what you think about it! aludra is ment to be a quick space stragey game, it's turnbased. you can move ships, fight enemies, conquer colonies, research. click a ship to see where it can move, click where it should move. all ships can always only move 1 field per turn. after a few turns, you have accumulated science points and can buy research. to do that enter the the SCIENCE menu and touch a research you can afford (available = non red). 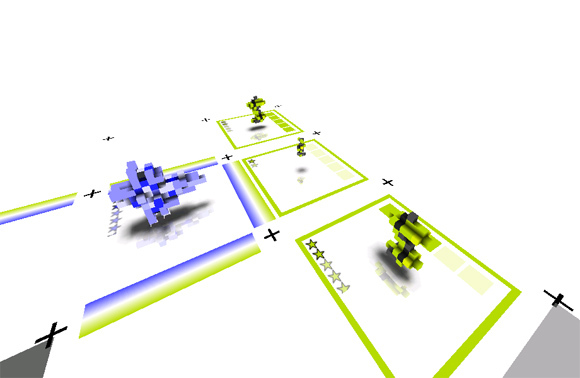 merge ships by moving them together onto one field. you start with small level 1 ships, when you move two level 1 ships together you get 1 level 2 ship. you start with max level 3, no further level can be reached. research higher levels to become stronger ships. conquer colonies (unclaimed ones or take them from the enemy) in order to produce new ships there. each turn 1 production point is shown on a colony, when max is reached (initialy 6 turns) a new level 1 ship is build on the colony, and production starts again. if you produce a new level 1 ship and already a ship is on the colony, they will merge as if you merged them manually. attack an enemy ship by moving onto it, you can see its strength by the small stars below the ship. the battle is luck based, each star means 3 potential points that can randomly be happening. there are darker stars, that mean the minimum strength a ship has, while the lighter stars display what can randomly be reached. a level N ship gets N battle points + N dice5 throws + M weapontech points. so if you have a level 3 ship and researched 4 weapon tech points, the ship will go into battle with a minimum of 3+4+3*1=11 points and a randomly reachable maximum of 3+4+3*5=22 points. it would be totaly save to attack a level 1 ship with 2 weapon tech points (as the ships potential max 1+2+1*5=8 is always lower than your minimum).